Had the best message on the weekend. 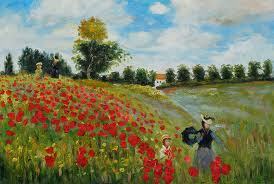 One of my readers http://21centurymom.wordpress.com/ asked why she was so in love with Monet. I answered that it was because she had such great taste…then I got serious…sort of…and said “ it really doesn’t matter what I think, what matters is you. Ask yourself the question “Why do I love Monet?” “What’s he about – to me?” Sometimes the answer will pop into our head or heart right away, sometimes we have to sit with the question for a bit (even a day or two), but if we trust our own subconscious, the answer will come. I’m deeply grateful to the mentors in my life, but the best teacher is within. Let me know how you do. I’ll ask the same question about Monet and see what my subconscious gives me. I have to be honest, I’m very curious how similar/different our answers will be” It was all rather Jungian of me. This one might be my favourite. 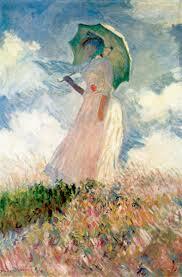 I went away for a bit and did just that – asked myself why I loved Monet so much. I realized it was because (for me) he captures exuberant peace. The colours and the movement of his painting is joyous and bright, but his paintings are deeply peaceful. I suddenly realized how badly I needed more of this in my own life. If you had asked me outright if I though exuberance and peace could co-exist, I would have suggested that they were opposites, Monet shows me that they’re not, and that they work beautifully together. I need to find that combination in my life – I do peace and I do exuberance, I need to find my inner Monet and do them both at the same time. 21century Mom comes back after a short time and talks about how Monet beautifully captures a moment in time. I would suggest that maybe her subconscious is letting her know that she should make an effort and capture more beautiful moments in time…I know I do. That’s the great thing about art – it speaks to all of us differently – if it is well done and honest, it will touch us as we need it to – when we need it to. Go have an art experience. I dare you. Egghead alert. The following post is a bit of deeper stuff about the whole love issue. Skip it and go right onto the other posts if you’re not interested. Psychology Today (link below) says that falling in love is like with being on Cocaine. I didn’t need Psychology Today to tell me that, BEEN THERE, and I can tell you for sure that Falling in Love sure felt like that time the Dr. put me on Morphine . . . can’t draw a direct comparison with Cocaine – haven’t been there. We can only fall CRAZY in love with someone we don’t know. Once we get to know them, assuming we still love them, we actually love them (very different from the Romantic notion of being “In Love”. We know their faults, where they come up short, how they drive us crazy, and we decide to love them anyway. Carl Jung*says that when we fall crazy in love that we are getting sucked in by a projection. Some part of our subconscious knows we have to learn something and it sees (or feels) that this person can teach us what we need to know. In simple terms “I fall for anyone who’s kind to me” can mean “I need to be kind to myself”. “I fall for strong guys” could be telling us “I need to learn to be strong”, “I always fall for party girls” might be trying to tell us we need to loosen up a bit. * Big time Smarty Pants psychologist – worked with Freud until they had a big, stinky fight and didn’t talk again for years . . . maybe they needed a good therapist.